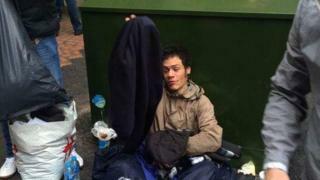 An MP has called for tougher action to stop people from becoming homeless, which he called a "moral emergency". Liam Byrne, Labour MP for Birmingham's Hodge Hill, said he wanted a "Kane's Law", named after Kane Walker, who died near the city's Bullring in January. He said the "cracks are so big" between services and called for more action to prevent rough sleeping. Mr Byrne said he had the backing of all 10 of the city's MPs and would raise it with the housing minister. The number of rough sleepers in Birmingham increased by 60% last year, and Mr Byrne's proposals aim for services to intervene before people end up on the streets. "Kane was a beautiful young man who fell through the cracks," he said. "The cracks are so big, many people are falling through and that's an injustice we've got to end." In August, Housing Secretary James Brokenshire vowed to end rough sleeping by 2027 as he announced £100m in funding to tackle homelessness. However, Mr Byrne said plans needed to be "bolder" with a greater focus on preventative action, starting with a more joined-up approach from different services. "We need public agencies to work together to stop people becoming homeless in the first place," he said. "We've got to do what we can to make sure the safety net is woven a lot tighter than it is today." Kane's Law was discussed at a homelessness summit on Friday with Birmingham MPs as well as representatives from the city council and the region's homelessness charities. Mr Byrne said he would be raising the idea at a meeting with Mr Brokenshire. Minister for Housing and Homelessness, Heather Wheeler, said the government is changing the law to require councils to provide earlier support to vulnerable people and is piloting a homelessness scheme in the West Midlands. The West Midlands Combined Authority said it was unable to comment at the moment.